Remember those hazy, lazy, crazy days of summer? Who would want to forget them! 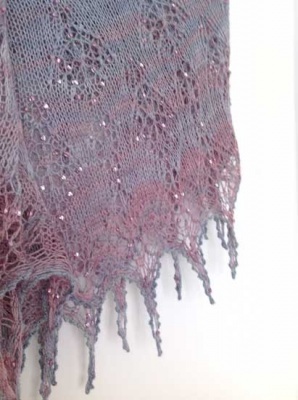 This top-down, crescent shaped shawl is delicate, lacy and dripping with beads. The stocking stitch body leads into a profusion of romantic lace reminiscent of nodding flowers; bluebells, honeybells, fuchsias . . . The beads whisper as the shawl moves and the overall effect is a shimmer of romantic mist – a hazy daze of a shawl! In Cirrus, the new heavy lace weight 80/20 blend of merino/silk, each kit will have four skeins totaling at least 872 yards. We are offering three new colorways developed by Kelly and based on the circle you see in the second photo on this page. She originally named this circle Waning Rainbow but it has adopted the name of this shawl (slightly modified) and is now called Hazy Days. It includes all of the colors of the spectrum but softened up with a touch of gray. 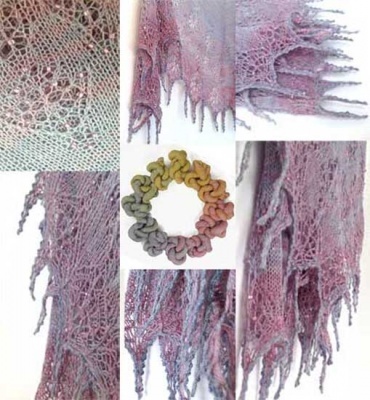 To select the colorway you'd like to knit your shawl in, look at the circle and try to think of it as a clock. Bev chose from 5:00 to 8:00 for her shawl and those are the partial photos you see above -- a beautiful delicacy of coolness. One of the test knitters knit on 9:00 to 12:00 -- that one can be seen in the third photo on this page, poolside. That set of colors reminds me of the sky right after the sun has set -- quite delicate and lovely. Additionally, one might choose 1:00 to 4:00 -- a gorgeous sunrise of tones. 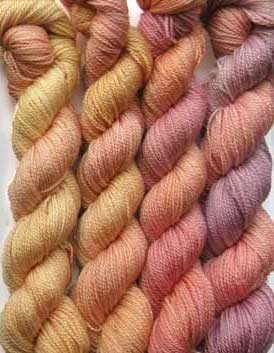 The skeins of yarns for this colorway are shown in the last photo on this page. The three colorways that this kit comes in are: One O'Clock to Four O'Clock (1:00 to 4:00), Five O'Clock to Eight O'Clock (5:00 to 8:00), or Nine O'Clock to Twelve O'Clock (9:00 to 12:00). Choose from the drop-down menu under the top photos on this page. 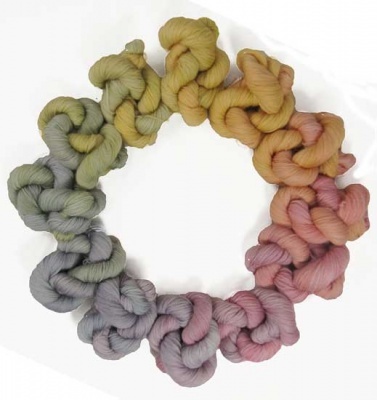 And note that the first skein of each set will be a larger 33 gram skein; the other three will be 25 grams. Because the colors are so gentle, I thought it best that the beads mirror this. As examples, for the 5:00 to 8:00 set I sent Bev Peony Pink Lined Crystal 5/0 Triangles. For the 9:00 to 12:00 set, I included Celery Lined Crystal AB ones. So each time the beads reflected the colors in the yarn and capture the light while staying somewhat subtle. If you have a definite idea for a different color you'd like, let me know. Otherwise let me choose for you. 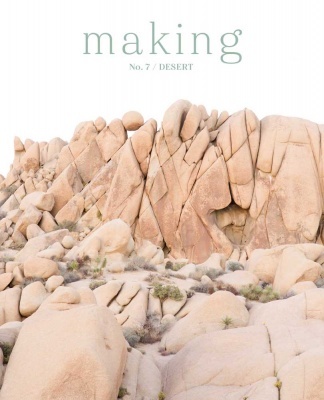 I know some knitters prefer to get the pattern directly from Bev via her Ravelry web page.